Will Losing 25 Pounds Really Make You Happy? Focus on these three things to equip you to love yourself, no matter how much you weigh. Can I ask you an important question about your bathroom scale. No, I’m not going to ask how much you weigh. Rather, a more sensitive question. But, I just have to ask it. Ready? Here it is: When did your bathroom scale get to be in charge of how you feel about yourself? Think about it. Your bathroom scale just lies on the floor day after day. It doesn’t help you pay the bills and it definitely doesn’t clean toilets. It’s just laying on the floor not bothering anybody. Yet it’s large and in charge of how you feel about yourself. Does your scale prompt you to either celebrate or criticize yourself? Does you scale control what you will or won’t wear? Does your scale influence how confident you feel when interacting with others? How did our scales gain such control of how we see ourselves? The easy answer is that we live in a culture that believes the lower the number on the scale, the more acceptable we are. And this is true of Christian women, who pretend not to care, but really do. The real answer is that every woman, regardless of her age, struggle at some level with what I call our “ugly struggle with beauty.” The core of this struggle isn’t about the number on the scale or the size that we wear. Ladies, our struggle is because we’re losing the battle to hold onto our God-given identity in a world that wants us to believe that beauty is a prize that only a few women can claim. Compounding this problem is that far too many Christian women think that it is unspiritual to talk about our physical bodies, our size, our shape, or our style. Christian women dropped out of the culture’s conversation about beauty. God owns beauty! He is the Creator of beauty, not us. Not celebrities. Not Instagram. Not Snapchat filters (even though they are pretty amazing)! As God’s daughters and ambassadors, we need to be in charge! In the world today when our young daughters and granddaughters are literally dying over their ugly struggle, we need to talk about inner and outer beauty MORE, not less! That’s why I wrote my Beautiful Already Bible Study because I want to help Christian women who love Jesus, but hate their bodies. We are so much more than a number we see on our bathroom scale! The battle is learning to see ourselves – both inside AND out – through God’s eyes. If we know who God is, then we’ll have the right perspective on ourselves. 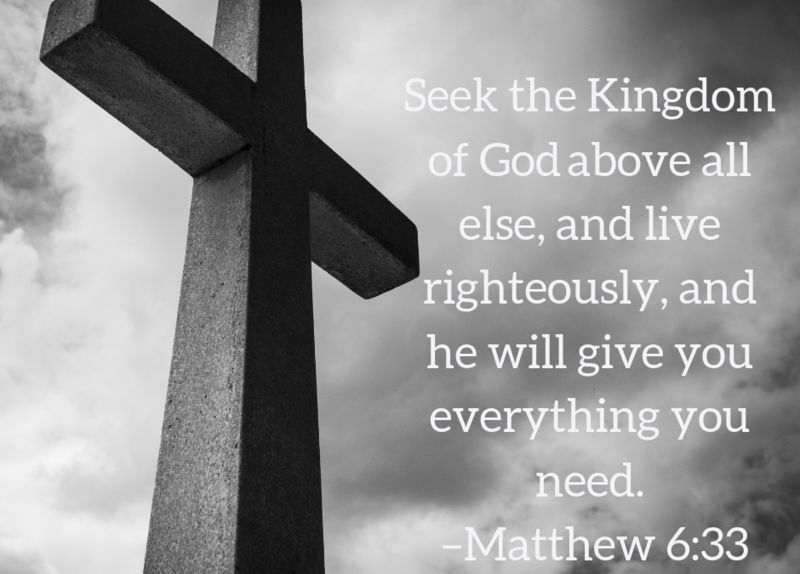 Notice the first part of the verse: Seek God first. When we seek God first, that means we take our eyes off ourselves. This means that I subject my opinions and beliefs about my body through the filter of God’s truth. Our tendency is to look at our bodies through our past, our failures, and our comparisons to other women. Seeking God’s kingdom above all else is an invitation to leave our prisons of judgment and shame for a place of freedom and hope! So, what does this practically look like for us when we’re about to hop on the bathroom scale? Here are three God-honoring truths to keep in mind when you’re tempted to let the numbers on the scales dictate your value as a woman. By the way, I share my weight pretty regularly when I talk to women and I’ll share it at the bottom of this post. Even though you may not like the number on the scale, or the size or shape of one of your body parts, focus on the idea that those parts were created for you by God. Remember, everything that God made fits His definition of Goodness. We need to proclaim that goodness and adopt God’s truth rather than our own. Say this: God, thank you for my body, crafted by your all-powerful, creative hands. Genesis 1:31 says that You have made all things good, including me. I reject any whispers that I am unworthy because of the number on the scale and choose to focus on your truth. Amen. Our bodies don’t have to be the world’s version of perfect for us to give God thanks for it. When’s the last time that you thanked God for the parts of you that are a little fluffier, saggy, or more flabby than you’d like? God, you’ve blessed me with this body. The number on the scale is just a number, but it doesn’t compare to the beautiful, valuable creation that You’ve made me to be. Amen. Each part of our body has a God-defined purpose. We don’t have to overthink this one, but we can easily condemn our hips, stomachs, sagging arms, or thighs. We are all unique creations and God has a specific purpose for us. He wants to use YOU to bring value to others that far exceeds anything that you could ever ask or imagine. God, it is so easy for me to say mean things about my body or weight. Instead, I must see my body as a tool that you want to use to make a difference in someone’s life. Amen. Our reward is that we learn to experience the joy that comes from seeing God’s goodness, bless and purpose for the body that He has given to us. Isn’t that a lot better than beating ourselves up, pulling on a pair of yoga pants, and binging on old Christmas cookies? That’s okay. It’s okay not to be okay. But, God doesn’t want you to stay that way. Might I suggest saying at least one of those prayers daily for a week. Be willing to let God work in your heart. And what some of you have been “weighting” for – ha! My weight is 178 pounds. It’s just a number and determines nothing about my value as a beautiful daughter of God. COMMENT: Do you feel like you can win your ugly struggle with your bathroom scale? What would it take for you to love yourself as God loves you – no matter your weight?